Connect your parallel device to serial port or serial device to parallel port. 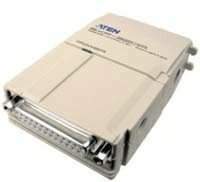 Aten�s high performance converter features both a DB25-F RS-232C (DCE) and a Centronics 36 Pin Male connection. This unit supports both hardware and software (Xon/Xoff) handshaking.